The Milwaukee Public Market is a great place to visit to enjoy a wide variety of fresh produce, meats, specialty items, and prepared foods. There is something here for everyone at the Milwaukee Public Market. Take a walk around and enjoy all the offerings that the market has from its various vendors. From freshly prepared stuffed sandwiches to assorted chocolates and fresh meat, the Milwaukee Public Market is the place to go for all your local shopping. There are also assortments of restaurants that offer a wide variety of cuisine. Customers can even take part in cooking classes. The Milwaukee Public Market is a great place to shop, dine, and learn more about the local Milwaukee communities. 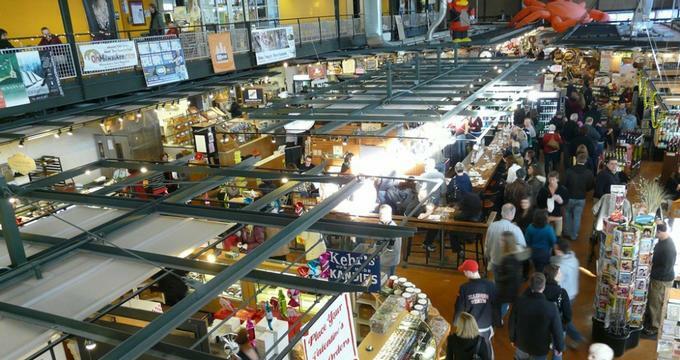 The Milwaukee Public Market operates 7 days a week. The Milwaukee Public Market offers an assortment of cooking classes to the general public at Madame Kuony’s Kitchen. There is a fee for each of the cooking classes, and due to their popularity, the cooking classes fill up quickly. A full listing of the current and upcoming cooking classes is available on the Milwaukee Public Market website. Those interested in reserving a space for an applicable cooking class can do so online. Please note that once reservations are made, refunds are not provided for cancellations unless the cancellation is made by the Milwaukee Public Market. In addition to cooking classes, the Milwaukee Public Market also offers private cooking classes. These types of classes are perfect for groups or team building exercises. Individuals that are interested in partaking of the private cooking classes are encouraged to contact the market directly at (414) 336-1111. The Milwaukee Public Market is the perfect place to host a private event of any type. Whether celebrating a birthday or getting married, the Milwaukee Public Market is fully prepared to provide a space that suits the needs of guests. With an assortment of vendors on-site, guests are sure to enjoy the wide variety of cuisine offered. The Palm Garden at the Milwaukee Public Market provides a beautiful space that is easily transformed based on the needs of the guests. There is also a complete state-of-the-art kitchen located on the second floor of the public market that can be sectioned off for private usage. The entire public market can be bought out if so desired for a special occasion or event. For more information on holding a private event at the Milwaukee Public Market, interested parties are encouraged to contact the market directly at (414) 336-1111.